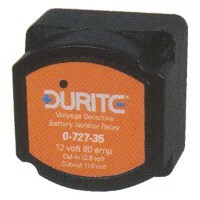 Voltage sensitive battery isolator relay, 12 volt 80 amp with red LED indicator. Disconnects non essential loads from the battery to prevent start battery being discharged. Relay makes at 12.8 volts and breaks at 11.0 volts. CE approved.